You are here: Home / Tours and Live Performances / 2016 The Original High / Adam Lambert’s Los Angeles Concert – Fan Pre-Show Dinner! Are you going to the first night of Adam Lambert’s Los Angeles concerts at The Orpheum Theatre? If so, we want to see you! This website has a great reputation for bringing fans together, not only online but in person too. We have a history of fans enjoying themselves at our pre-show dinner celebrations and the Los Angeles concert is joining our list! 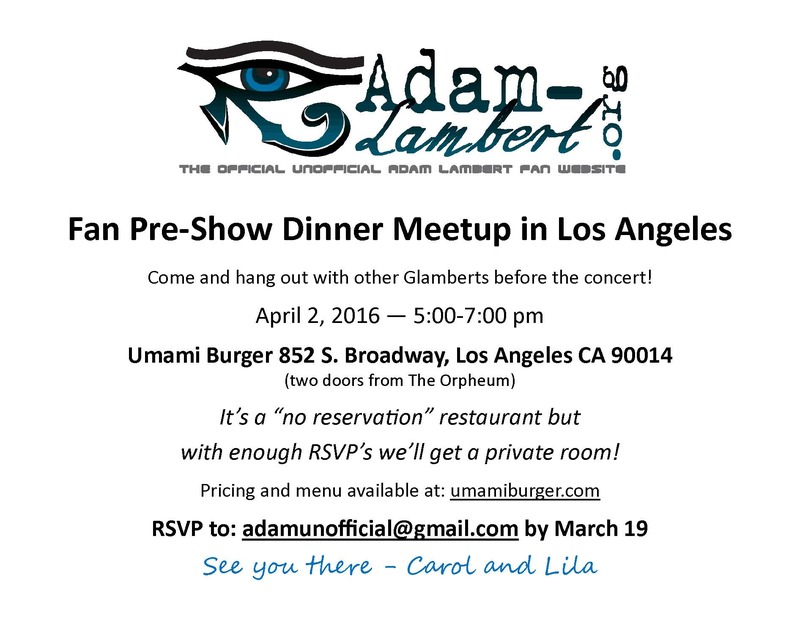 Join Lila, Carol and your fellow Glamberts for a pre-show dinner at Umami Burger from 5 – 7 PM, two doors down from The Orpheum. Their fabulous menu awaits, which has received GQ’s Burger of the Year distinction! See the menu here. Even if you’re not going to the concert but will be in the area, maybe going to the next night’s show, please join us. We’d love to celebrate with you! We’re looking for enough RSVPs by March 19 to get a private room! Wish I lived even somewhat close…..I’m in Wisconsin, so I will go to the March 22 show in Milwaukee and the March 23 show in Chicago. Not enough but life is too busy. I wish I still lived in Calif just so I could go to this but it was a long time ago and I live way over here in Texas ???? It should be great! Hope to see everyone there! Soo excited to see you two and others who’ll be there!!! And of course ADAM!!!!! vote for the Glamberts so we can win the best fan club. You can vote 50 times a day. Went to see him in Charlotte NC on Sunday. and of course he was wonderful. Sounded great looked beautiful and sang most of my favorite songs Just wish he would have sung longer. Had a wonderful time. Go to Taco Bell Best Fan Army and you can vote 50 times in a row and it takes no time at all. It’s Robin Smith (remember from the Star 94.1 Bali Hai Super Secret M&G in San Diego?) Count us in for the party!!! There will be 3 for sure, and we still have another ticket unclaimed, so maybe 4. Thanks for organizing this – CAN’T WAIT!!! Of course I remember! Have you or the other 3 also RSVP’d to Cameron’s Queenbert Facebook page? I just want to make sure we don’t double our numbers. See you there! I have always wanted to see Adam in concert. But I live way to far away to go to Los Angeles. Have a great show Adam! I know you will with that wonderful voice you have! And tons of charisma too! Where can I sign up –I would like to attend the pre show dinner on April 2nd in LA before Adam’s concert. I will be bringing one friend with me.. I tried to RSVP to the adamunofficial@gmail.com link but couldn’t get connected? Thanks. Trying to RSVP for April 2nd LA pre show dinner???? The link you posted doesn’t work. Sorry about that! You can send an email to adamunofficial@gmail.com. Glad you’re coming!! Don’t worry about emailing Lorraine – we’ve got you marked down for 2. See you there! Just to let you know—-there are other folks on the Adamtopia site who are having trouble responding to your email and are wanting to RSVP to this pre concert dinner on April 2nd.Maybe there’s another link they could use? Thank you. I don’t know what the trouble is sending to an email address. It is not a link above, just a picture of a flyer. People should send an email to adamunofficial@gmail.com. Hope this helps! Will be at the April 3 show. Sorry to miss party but can’t wait to see Adam. Saw Adam won first round of PopCrush too. Keep voting for Adam on iHeart Taco Bell best fans. See you in LA.